I had to take a minute to let that sink in. My favorite place in the world, a California State Park (actually, a National Monument) I never miss when I’m in the Bay Area, was made possible by my host’s family. I thanked the family silently and went to visit Muir Woods for what is probably the tenth time. 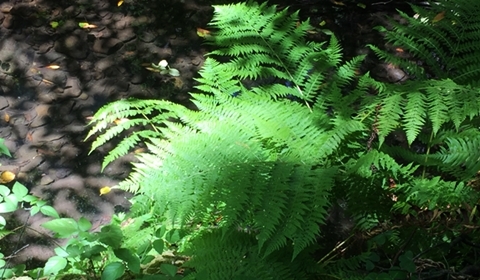 Ferns and fern allies in the sun. 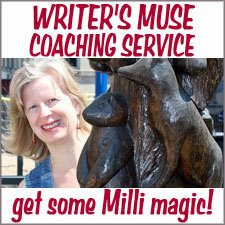 Muir Woods is located somewhere in the middle of a twisty-turny road on the way to Stinson Beach. If you get carsick, this is definitely a road where you’ll need some Dramamine or some other trick to keep the food in your stomach where it belongs! There are small stretches of straightaways but they’re quickly replaced by hairpin turns where you are traveling, at most, 15-25 m.p.h. 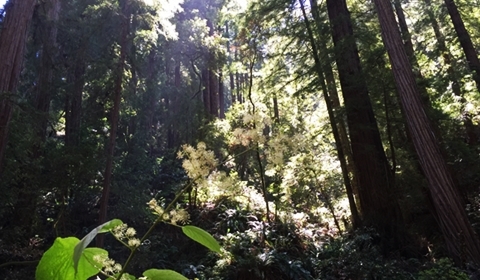 Muir Woods is host to 13 species of ferns from six different fern families. 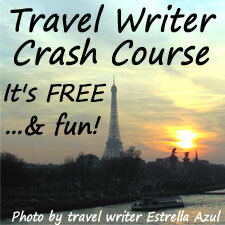 My best advice is to arrive early to avoid the crowds; advice I did not take myself on our most recent trip. We arrived around 2 p.m. only to find that people were parking alongside the road at least a mile from the entrance. Although we saw that the parking lot was full, and the overflow lot was full, and the over-overflow parking lot was full, we decided to take a chance and wait for someone to leave. We didn’t have to wait too long although we had time to sit and ponder why a family would choose to have lunch in their minivan rather than at one of the picnic areas inside the park. 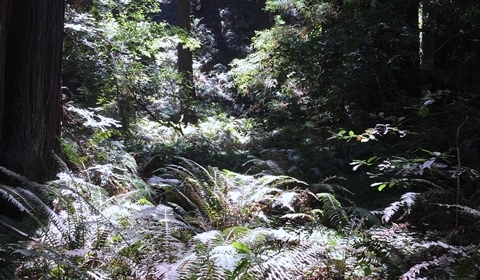 Plants adapt to low light levels on the forest floor. Muir Woods is free for kids under the age of 16 but anyone over 16 pays a fee of $10. It is worth every penny and, if I lived closer, I would buy the year pass for $40 that provides admission for four. Well worth the minimal cost. The redwoods dominate the scene. The park has restrooms, a small cafe, and a well-stocked gift shop at the entrance so nobody has to suffer without the comforts of home while leaving the world behind for a couple of hours. With kids in tow, we always have to stop at all three conveniences usually before and after our hike. If I were an excellent planner, I’d bring lunch though, because the cafe at Muir Woods is pretty pricey for what you get. 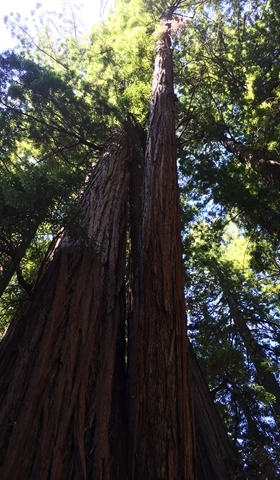 Redwoods in Muir Woods are still young, as they can live up to 2200 years. 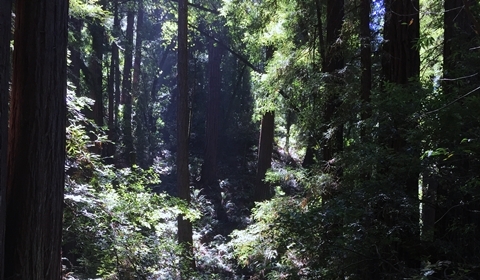 What you don’t have at Muir Woods is cell service so there’s no chance your serenity will be interrupted by someone gossiping, adding to the grocery list, or overhearing the latest sport scores while strolling through the peaceful green canopy. Intense shades of green and brown. Walking through the enormous trees is so peaceful and calming even when the park is crowded. 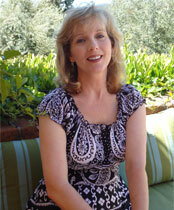 Intense shades of green are in abundance, as are the reds of the Redwoods and the browns of other plant material. Be sure to look for the wildflowers that dot the landscape, mushrooms such as turkey tail, and various wildlife. We’ve seen a six-inch banana slug in the past and beautifully colored birds. 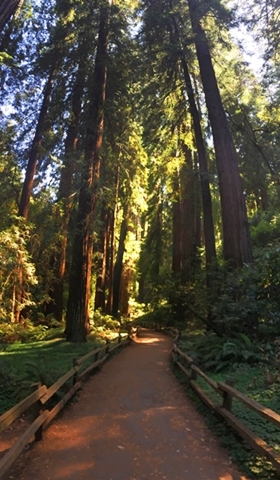 One of the Muir Woods walkways. The trails through Muir Woods National Monument are accessible by everyone of any age and physical ability. The paths are well marked and paved in one manner or another. The forest hikes can range anywhere from a half-hour to an hour-and-a-half loop; however, there are longer and more difficult walks for the more adventurous. My family and I have always taken the hour-long loop, which is scenic, peaceful, and chock full of nature—but one of these days I know we will bring our adventurous spirit and branch out to another level of hike. 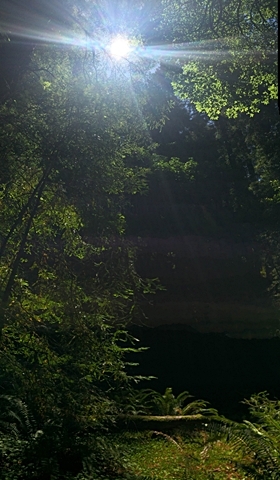 Scenic and peaceful old-growth redwood forest. 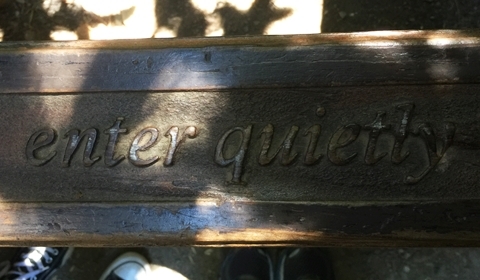 Spending a few hours in the woods is a great way to lose the crowds at Fisherman’s Wharf or Ghiradelli Square and develop a deep appreciation for calm and silence. I know I visit Muir Woods each time I visit the Bay Area because of its slow pace and muted conversations, a stark contrast to the yelling, laughing, and frenzied traffic noises. 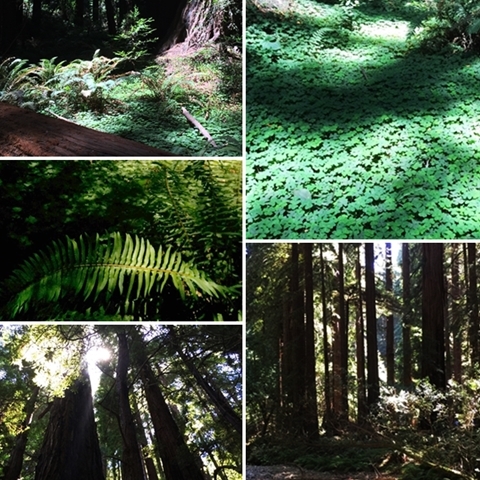 Take my advice and add Muir Wood National Monument to your list of things you must do when visiting San Francisco.